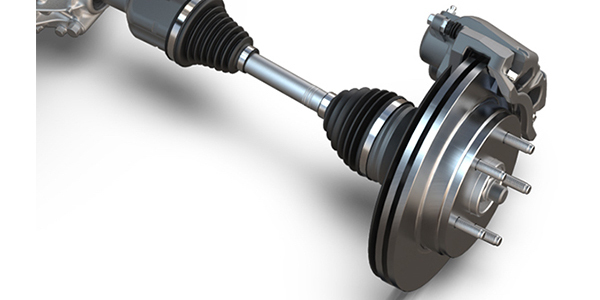 The fourth generation Dodge Ram is probably one of the most trouble-free brake systems you’ll see. There are light- and heavy-duty brake packages. The light-duty package for the 1500 uses floating dual-piston calipers in the front and single-piston floating calipers in the rear. The heavy-duty package for the 2500 and 3500 uses floating dual-piston calipers in the front and dual-piston floating calipers in the rear. 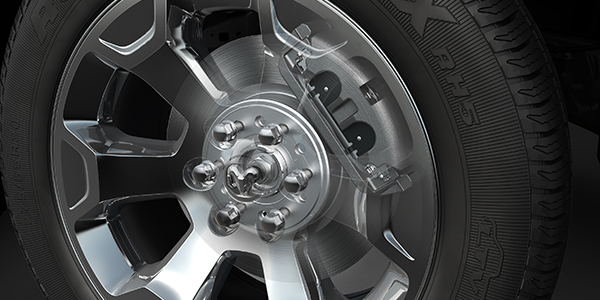 The light-duty brake package uses spring clips on the ends of the brake pad that reduce brake drag and noise. These clips should always be replaced with the brake pads. The heavy-duty package uses abutment clips that snap over the slides on the bracket. Servicing the pads and rotors is simple, typically with few surprises. The torque specifications for the light-duty package are 130 ft./lbs. for the front caliper brackets and 120 ft./lbs. for the rear caliper brackets. The heavy-duty front brake caliper bracket has a torque specification of 275 ft./lbs. The rear caliper bracket for the heavy-duty caliper has a torque specification of 163 ft/lbs for the upper bolt and 190 ft/lbs for the lower bolt. Both versions have a torque specification of 32 ft./lbs. for the guide pins. On diesel-powered Dodge Rams, you will have to inspect the hydraulic brake booster as part of the brake job. The hydraulic booster uses hydraulic pressure from the power steering pump. 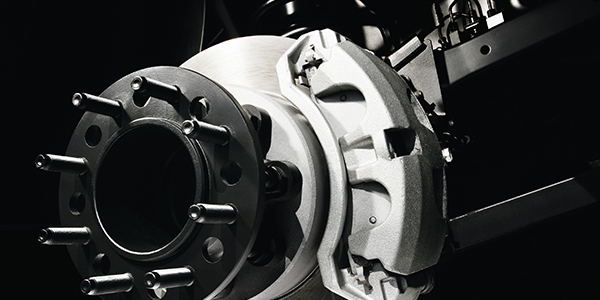 Before diagnosing a booster problem, first verify the power steering pump is operating properly by checking the levels of the power steering fluid and brake fluid. The hydraulic booster unit will produce certain characteristic booster noises. The noises may occur when the brake pedal is used in a manner not associated with normal braking or driving. HISSING: A hissing noise may be noticed when above-normal brake pedal pressure is applied (40 lbs. or above). The noise will be more noticeable if the vehicle is not moving. The noise will increase with the brake pedal pressure and an increase of system operating temperature. CLUNK-CHATTER-CLICKING: A clunk-chatter-clicking may be noticed when the brake pedal is released quickly after above normal brake pedal pressure is applied (50-100 lbs.). To check the function of the booster, turn the engine off and depress the brake pedal several times to discharge the accumulator. Then depress the brake pedal using 40 lbs. of force and start the engine. The brake pedal should fall and then push back against your foot. This indicates the booster is operating correctly. To test the accumulator, start the engine, apply the brakes and turn the steering wheel from lock to lock. This will ensure the accumulator is charged. Turn off the engine and let the vehicle sit for one hour. After one hour, there should be at least two power-assisted brake applications with the engine off. If the system does not retain a charge, the booster must be replaced. With the engine off, depress the brake pedal several times to discharge the accumulator. Grasp the accumulator and see if it wobbles or turns. If it does, the accumulator has lost a gas charge, and the booster must be replaced. Most models come with an Integrated Trailer Brake Module (ITBM). This unit is designed to not only operate the lights, but also to actuate electric trailer brakes. It uses an accelerometer to control the trailer brakes. The ITBM is located in the instrument panel to the left of the steering column above the park brake release handle. Near the center of the ITBM is a numerical LED and trailer icon that illuminates for three seconds when the ignition switch is placed in the RUN position. There is also an adjustment switch and a trailer manual sliding brake lever/switch on the face of the ITBM. The ITBM is powered with an ignition ON voltage source and has a single ground connection. The ITBM communicates on the CAN bus for vehicle speed signal, Electronic Stability Control (ESC) active signal and VIN information. There is also a hardwired brake switch input into the ITBM. The ITBM uses this information along with an internal accelerometer to determine how much braking to apply to the trailer brakes. The output is a Pulse Width Modulated (PWM) circuit for control of the trailer braking intensity during stops. 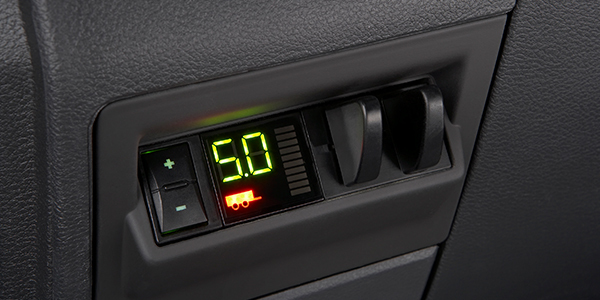 The user adjusts the ratio between vehicle braking and trailer braking with the plus/minus (±) switch on the face of the module. In addition to automatic trailer braking, the user can manually apply the trailer brakes before, or without, using the vehicle brakes by sliding the ITBM manual sliding brake lever/switch to the right at any time. In this circumstance, the accelerometer and other trailer braking inputs are ignored, and the user controls trailer braking intensity. Disconnect all jumper wires and reconnect all previously disconnected components and connectors. Make sure all accessories are turned off. With the scan tool, record and erase all DTC(s) from the ITBM. Start the engine and allow it to idle for two minutes while operating all functions of the system that caused the original problem. 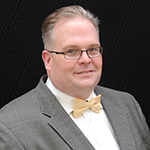 Perform the ITBM VERIFICATION TEST. Turn the ignition off, wait five seconds, and then turn the ignition on. Using the scan tool, read DTC(s) from the ITBM.